Japan’s election: Is either party listening? For over a thousand years, Roman conquerors returning from the wars enjoyed the honor of a triumph, a tumultuous parade. In the procession came trumpeters and musicians and strange animals from the conquered territories, together with carts, laden with treasure and captured armaments. The conqueror rode in a triumphal chariot, the dazed prisoners walking in chains before him. Sometimes, his children, robed in white, stood with him in the chariot or rode the trace horses. A slave stood behind the conqueror, holding a golden crown, and whispering a warning, “All glory is fleeting”. IT WAS A HISTORIC ELECTION IN JAPAN. The victors were stunned by the magnitude of their victory. The losers appeared shell-shocked, so dazed it seemed as if they would require minders to keep them from walking into the walls. The mass media was agog with the sheer spectacle and novelty and couldn’t stop talking about it. Sound familiar? It should—that’s exactly what happened nearly two years ago when former Prime Minister Junichiro Koizumi of the ruling Liberal Democratic Party shocked the nation (and delighted the voters) by dissolving the lower house of the Diet, calling a new election, and flattening the opposition like so much road kill to win the second highest majority ever in that body. On Sunday, the winds of change abruptly reversed direction at gale force as the voters literally kicked the LDP out of the driver’s seat and gave control of the inaptly named upper house to the opposition Democratic Party of Japan. The astonishing margins of victory in these two epochal elections created a huge majority for the LDP in the lower house and a substantial majority for the DPJ in the upper house. It is critical for the continued health and survival of both parties–and the creation of a viable two-party system in the country–that the LDP and the DPJ come to grips with an increasingly volatile, demanding, and independent electorate. Yet neither they, nor the mass media, have given any indication that they comprehend what these elections mean. THE MOST IMPRESSIVE festival action this weekend occurred in Kyushu for the second week in a row. In fact, the two festivals profiled here were held in Fukuoka Prefecture at the northern end of the island. Those were Daijayama in Omuta the Tobata Gion Festival in Kitakyushu. Omuta is a former coal-mining town in southern Fukuoka Prefecture. The festival in its current form is a combination of several local festivals, the oldest of which is the Daijayama Festival, thought to have originated sometime between 1640 and 1791. 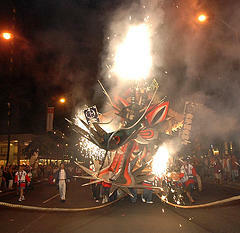 This event is known for its floats of sea serpents, said to be the symbol of the water god. In later years it was combined with the elements of a Gion festival conducted for the gods of agriculture and as protection against illness. The big attraction is the sea serpents, however. Each of the six floats is six meters high, 10 meters long, and they require the efforts of 200-300 people to pull through the city. The first part of the festival features townspeople performing bon odori, the traditional summer festival dances, but the highlight comes after it gets dark. The floats are assembled in a single location after their parade through the city. The float carriers start shaking them wildly, and then the serpents’ mouths open to emit multicolored fireworks and smoke. Legend has it that any children bitten by a serpent’s tooth will be guaranteed a healthy, accident-free year. Nowadays, however, a smaller ceremony for snatching the eyeballs is held only for children. The floats themselves are still destroyed, and the eyeballs are offered to the divinities at the local shrine. People hang scraps from the destroyed floats on the eaves of their homes to ward off illness and protect the household for the coming year. The Tobata festival in Kitakyushu, also in Fukuoka Prefecture, dates from 1803. It was held to pray for good health after a plague struck the area the year before. It has a unique aspect that is shared by few, if any, festivals in Japan. Is the Abe administation going to crash? JAPAN FROM THE INSIDE OUT, says the subtitle on the masthead. In addition to my perspectives on the country from inside Japan, I sometimes present Japanese perspectives on their own country that ordinarily wouldn’t be available to an overseas audience. Sunday is the day of the upper house election, which is held every three years. It is the first big test for the administration of Prime Minister Shinzo Abe of the Liberal Democratic Party, and everyone expects him to fail it. All the poll numbers support this conclusion. The August issue of Shokun! magazine carries a roundtable discussion held with three political analysts who hold forth on the record of the Abe administration. The magazine indulges in a bit of sensationalism by calling it, “The Abe Administration is Going to Crash”. You will not find a better dissection of the current state of Japanese politics anywhere, however, and certainly not in English. The participants are fair, giving credit where credit is due, and at the same time pull no punches—some of which are devastating. To their credit, they also give the same treatment to the primary opposition party, the Democratic Party of Japan, and its leader, Ichiro Ozawa. What follows is a summary of a long article, rather than a translated transcription. I left a lot out, but the omissions were mostly details rather than essentials. OFFICIALS AT TOKYO’S ASAKUSA SHINTO SHRINE, which sponsors the Sanja Matsuri every May, announced that starting next year they will suspend the main event of the three-day festival, in which three large mikoshi (portable shrines containing the spirit of the deity) are brought out and paraded through the local neighborhood. It has been a tradition at this festival for people in the neighborhood to climb on the mikoshi as they are being carried through the streets. This behavior is usually not allowed at festivals because it is thought by some to defile the spirit of the divinity. But the local streets are narrow and filled with people, and the mikoshi are large, heavy, and cumbersome, so assistance is required for navigation. Problems arose during the festival last year when so many people climbed up on one mikoshi that those carrying it were unable to support it. The poles used to carry it broke and the mikoshi fell to the ground, which is considered a desecration. The festival organizers asked people not to climb aboard this year, but they were ignored. Control over the situation deteriorated to such an extent that several people were arrested. The shrine officials concluded they had to suspend this part of the festival if they were to reestablish control. 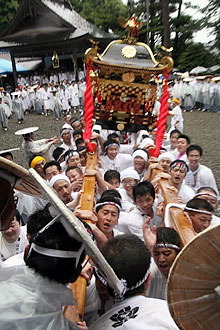 This is reportedly the first time in the event’s history this tradition has been interrputed, except for those years when the mikoshi were being repaired. As I’ve written about before (here and here), there’s more to this story than meets the eye. This huge festival attracts about 1.5 million visitors every year. The weight of the three mikoshi (a ton each), the distance they are carried, and the many shrine parishioners who want to be involved means that hundreds of people carry them. Some of the participants are not the sort of folks one would expect to see enthusiastically participating in religious ceremonies. 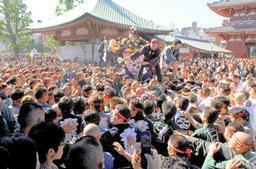 The Yamaguchi-gumi, Japan’s largest organization of yakuza, has an office near the shrine precincts, and its membership has assumed a prominent role in the festival for some time now. This is one of the few public events in which the yakuza make their participation known, primarily by removing their shirts and exposing their elaborate tattoos when they climb on the mikoshi. Police have become concerned that the mobsters are trying to use the festival, a highly visible event nationwide, as a method to assert their control over the neighborhood. In fact, groups of tattooed ones have taken to wandering from festival to festival in Tokyo lately looking for action and throwing their weight around. The shrine will conduct all the other events at the festival, and are considering other events as a substitute for carrying the mikoshi. 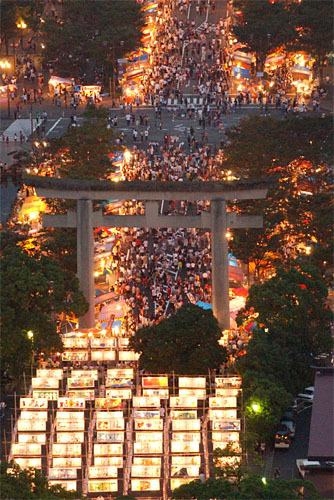 The Sanja Matsuri is a tradition that dates back 13 centuries. Here’s hoping the Asakusa shrine will be able to resume the most famous and visible part of that tradition in the not too distant future. DOUBLE, DOUBLE, TOIL AND TROUBLE, chanted the witches in Shakespeare’s Macbeth, but this miko at the Hachiman Shinto shrine in Kameoka, Kyoto, is not blending some evil brew or plotting the parishioners’ downfall. Rather, she’s getting all hot and steamy for their benefit. She’s conducting a Yutate Kagura ceremony that had been discontinued since the middle of the war, a period of more than 60 years, but was revived at the shrine last week. The miko, or shrine maiden, is dipping a bundle of sasa bamboo branches into the bubbling cauldron and using it to spread the steam while performing a dance. That’s the origin of the rite’s name–the word yu means hot water, tate means rising, and a kagura is a sacred Shinto dance. The intent is to provide thanks for the blessing of water and a prayer of supplication to avoid disasters. Legend has it that those touched by the steam will enjoy good health. Taking home one of the bamboo leaves will bring them good fortune in the year ahead. Conducted in tandem with the shrine’s summer festival, this ceremony included participants who were witnessing it for the first time, as well as some older people who remember seeing the last one performed when they were still children. Part of the main shrine building was destroyed last year in a typhoon. The subject of reviving the ceremony arose when the parishioners gathered to discuss the repair work. Purification ceremonies involving steam are not uncommon in the Kansai area, and several similar rites are held elsewhere. 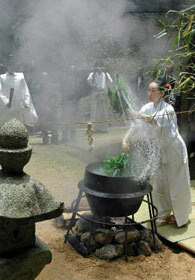 Sometimes, rice, sake, and salt are put in the cauldron, and the ceremony with the bamboo concludes the rite. Try this page for a series of photos of a similar event at a different shrine, and this photo for a dramatic look at the miko swirling the steam! And for a picture of the shrine itself, which is in a small mountain village, try this page. It’s the fifth one from the top. SO SANG JOHN LENNON more than 35 years ago, and while those who have to deal with the world the way it is would find it difficult to conjure up that vision in their imagination, we shouldn’t be as hard on him as some commentators on the Right have been over the past few years. Not only was he a product of the times, but by the time he wrote those lines, Lennon’s enormous celebrity had swollen his head to such an extent his eyes were no longer in focus. We have determined to preserve our security and existence, trusting in the justice and faith of the peace-loving peoples of the world. That, of course is the Constitution’s famous (or infamous) Article 9. Political leaders who have to deal with the real world can’t spare the time for imagining that scenario—taking it seriously would be fatal–but perhaps we shouldn’t be as hard on the authors as some commentators on the Right have been. Not only were these sentences a product of the times, but by the time the authors wrote those lines, after 12 straight years in control of America’s Executive and Legislative branches, FDR’s New Dealers had become so intoxicated by success their eyes were no longer in focus. Unfortunately, they were too busy using their imagination to foresee the aggressive nationalism of 21st century China, which combines the worst aspects of Marxism, capitalism, and Manifest Destiny, or the malignant growth of 21st century North Korea, which combines the worst aspects of Stalinism, pure land Koreanism, and oddball religious cults. What is a country to do? In Japan’s case, they’ve turned to the practice of constitutional yoga, twisting the text into political asanas to create interpretive results that don’t seem possible at first, or even second, glance. Now designated an important intangible cultural asset by the national government, the Hita Gion Festival in Hita, Oita Prefecture, dates back to 1714 in its present form. The festival is held to pray for protection against illness and disasters caused by the weather. It features a parade of nine elaborate floats whose decorations are based on themes from kabuki stories. These floats are paraded through the town both day and night. They are not merely lifted and taken from one spot to another—the men doing the carrying rotate them and raise them up and down as they proceed. The people of Hita think the hayashi, or musical accompaniment, performed with flutes, taiko drums, and shamisen, is distinctively different from others performed in Japan. At the top of the page of this Japanese-language link is WAV file that will give you a sample of the music. You’ll quickly recognize it from the moving musical notes. This link has several photos taken in the daytime at the 1995 event. And this page has an 11-minute video that’s one of the best I’ve ever seen of a Japanese festival. The folks in the Hamasaki district of Karatsu, Saga Prefecture, a coastal town on the Sea of Japan, also have a Gion festival on the same day. Their festival dates from 1753, when a local merchant visited the Gion shrine in Kyoto on business. Passing through Hakata on the way back, he saw the excitement generated by their Gion festival and organized one for Hamasaki. It’s held to pray for protection against illness and for a rich harvest. There are three floats, built separately and maintained by groups of local fishermen, businessmen, and farmers. 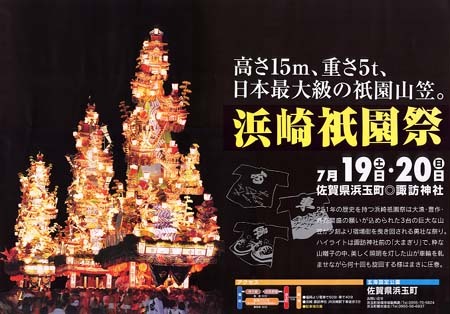 Each float is 15 meters high and weighs about five tons, making them among the biggest used in any Kyushu festival. The people in Fukuoka reduced the size of their floats with the advent of overhead power lines and stoplights, but the city fathers of Hamasaki had their priorities straight and decided to keep the height of the floats the same. They’ve mapped out the parade route to avoid any obstacles. It takes 150 men to lug one of these bruisers around town. It’s difficult enough to imagine the effort it takes to keep them erect on a city street now. Imagine what it must have been like years ago before the streets were paved. The floats are rebuilt every year, and the decorations are based on famous scenes from traditional stories. The Hamasaki festival uses more than 10 hayashi tunes, performed with flutes, taiko drums, bells, and shamisen. There are subtle differences in the tunes played by the musicians on each float, and they change the tune depending on the road conditions. Slower numbers are played when going up hills, and the tempo picks up whenever they round curves. The highlight comes late at night when the three floats converge on the shrine grounds after their parade through town. The folks in Hamasaki aren’t satisfied with anything as mundane as merely pulling the floats through town. No sir. They light the lanterns on the floats and spin them around dozens of times, creating the effect of rings of fire against the backdrop of the night sky. After the festival, the groups responsible for the floats completely disassemble them. They will have disappeared by the next morning. Work on the floats for the following year’s festival will begin in six months and finish about two days before the festival starts. Make sure you click on this link with photos of last year’s floats in the daytime. It puts the Rose Parade to shame! LAST WEEK, we had a post on the growing acceptance in Japan of mergers and acquisitions, which the domestic business and financial world has been leery of in the past. This week, my local newspaper carried an article on the Daiwa Institute of Research’s survey of exchange-listed companies on their attitudes toward mergers and acquisitions. The article carried no byline, nor did it state that it came from a news agency. It did contain some items of interest, however, so I’ll quickly summarize the results here. DIR and Daiwa Investor Relations jointly conducted the survey by questionnaire of 700 companies listed on Japanese stock exchanges, from May 18th to the 31st. They received replies from 210. The survey showed that more than 60% of the Japanese companies that responded are opposed to hostile takeovers by investment funds, yet recognize that M&As between companies are a legitimate business strategy for survival. To be more precise, a total of 62% of the responding companies said that hostile takeovers by investment funds were not desirable. Forty-six percent of the respondents said they felt threatened by hostile takeovers. When asked the source of the threat (multiple answers allowed), 60 of the 210 companies said investment funds, 49 said other companies in the same industry overseas, and 46 said other companies in the same industry in Japan. The author of the article suggested the survey indicates that the M&A offensives of foreign capital-affiliated investment funds, such as Steel Partners Japan Strategic Fund, are beginning to have an impact on corporate thinking. The head of the DIR survey division said it was possible to interpret the results as showing that the objectives for investment fund acquisitions are not well understood. When asked about hostile takeovers of one company by another, a total of 74% of those who responded said either that they were natural to expect or that nothing could be done about them. In contrast, this combined total stood at 35% for hostile takeovers by investment funds. Thirty-nine percent answered that they thought their own company might become a target for a takeover in the future. The author noted this last figure has prompted some Japanese observers to speculate that current perceptions in domestic business and financial circles will accelerate moves toward corporate reorganization. Here is the link to a paper written by Xu Peng of RIETI examining the characteristics of companies that are targeted for takeover by Japanese investment funds, including the aforementioned Steel Partners Japan. Says Xu, “The results of empirical analysis suggest that undervalued companies that are cash flow rich…and have a low debt ratio and a low interlocking shareholding ratio” are the prime targets. He thinks the M&A trend will lead to a shakeout and increase the value of the survivors. THIS WEEK, Mie Prefecture was the scene of a few smaller festivals that had a more down-home feel than some of the extravaganzas that are staged, but every bit as much fun. 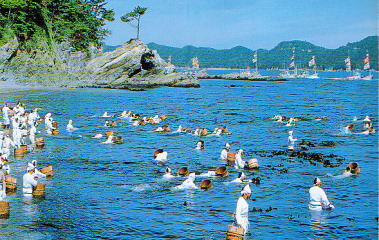 One was the Osatsu Tenno Whale Festival, held in Osatsu-cho, Toba, on the 14th. Local youth groups and students from primary and secondary schools parade with two mikoshi modeled after whales. Mikoshi are portable Shinto shrines; the idea is that the spirit of the local shrine divinity is inside. 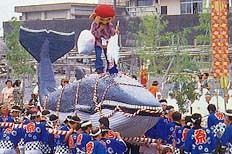 The two whale mikoshi in Osatsu-cho symbolize parent and child. Maybe the guys in the Ishiki region of the prefecture would have liked people to splash water on them to cool off during the heat of the action in the annual Zaruyaburi festival, held this week at the Ishikia and Yakumo shrines. About 70 or 80 young men participate in a so-called naked festival to battle each other for control of a zaru basket. Legend has it that the man who ends up with the basket will have good luck and health during the year. A naked festival is not quite as dangerous as it sounds—during most naked festivals in Japan, the men wear traditional loincloths similar to those worn by sumo wrestlers, so they don’t have to worry about taking a shot below the belt (or below where their belt would usually be) as they grapple for the prize. I think the women of Mie have a better idea for competing than getting naked and fighting over control of some basket. They choose to dive for abalone instead. The Shirongo Shrine’s Shirongo Festival was held this week on a day when catching fish is normally prohibited. At the sound of a note from a triton horn, the women dive into the water simultaneously and compete to be the first to catch an abalone. The women who catch the first male and female abalone offer them at the shrine to pray for safety sea journeys and an abundant catch. 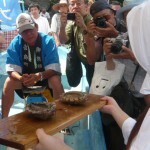 Shown here is the winner, who has placed her abalone on a ship plank. She’s entered the shrine still in her wet uniform, through the torii seen in the back, to make the offering. Here’s an arty little video clip about the women who catch the abalone produced by ABC in Australia. It lasts five minutes, and you need RealPlayer. JAPAN HAS WARNED U.S. CONGRESSIONAL LEADERS that the House of Representatives’ passage of their comfort woman resolution would likely cause serious long-term damage to bilateral relations, according to a letter sent by Japanese Ambassador Ryozo Kato to House Speaker Nancy Pelosi and four other leaders, as reported here by the Washington Post. The newspaper says it has obtained a copy of the letter. What steps would Japan take? The letter says that “Japan may reconsider its role as one of the few loyal supporters of U.S. policy in Iraq, where it is the second-largest donor for rebuilding, after the United States.” The author of the article suggests that this is just one example. We do not know the entire text of the letter because it has not been made public. Yet I cannot stress enough that it is unprecedented in the postwar period for Japan to take such a harsh stance towards the United States. The Post itself notes that the letter was “unusually blunt”. The Post also reported that he dismissed it as “lobbying bluster”. Don’t be fooled. Look closely and you’ll see that Mr. Honda deliberately avoided the real issues. Of course Japanese and American companies will continue to do business with each other. Of course Japan is not going to sever diplomatic relations with the United States. Mr. Honda is just stating the obvious—but that’s not what the Japanese were talking about. The letter specifically mentions their financial support in Iraq. Japanese political leaders have to navigate some tricky straits at home to provide this support; this is a clear warning that the government might decide its money is better spent elsewhere. Many Japanese still remember that the United States prevailed upon them to spend $US 13 billion in assistance for Kuwait after the first Gulf War. They also remember that Kuwait did not see fit to thank them for it in an ad taken out in the same Washington Post. Japan also is contributing enormous amounts of money to support the 50,000 American troops on its soil, half of which are in Okinawa. The Japanese government has to go to great lengths to keep Okinawans pacified over the American presence on the islands. A large portion of the American military bases are on private property in the prefecture, and the Japanese government financially compensates the landowners for the American use of that land. Does the House of Representatives think there is no limit to the Japanese pocketbook or its patience? There are other possibilities as well. Japan is dependent on Middle Eastern oil for its energy, and it buys 11% of its oil from Iran, spending $US 10.1 trillion annually. Meanwhile, the government of Iran last week asked Japan to start paying for its oil purchases in yen instead of dollars because of concerns that the United States may seize its dollar assets as tensions increase over the Iranian nuclear development. They may start to find it advantageous after the House passes its resolution, however. Iranian nuclear weapons are unlikely to be used on Japan. In the past, Japan has financially contributed to relief after the San Francisco earthquakes (both of the big ones), cable car reconstruction, and relief after Katrina. In the future, it is possible they will focus their humanitarian expenditures on countries that are less able to cope financially, particularly for such tourist attractions as the cable cars. Abe made a carefully worded public apology for the “extreme hardships” suffered by the comfort women, but did not retract his claim about the lack of documentary proof of Japanese government involvement. Previous studies by the Japanese government have disclosed more than 100 documents showing Japanese military involvement in the building of brothels and the recruitment of women, according to a report last year by the Congressional Research Service. Error #1: Prime Minister Abe has not denied Japanese government involvement. He and everyone else in the country knows Imperial Japan facilitated the system and recruited women. He denied that it was Japanese government policy to coerce the women. Error #2: It has never been demonstrated that it was Japan’s wartime “policy” to coerce the women. Instances of coercion on the battlefield by individual units do not represent a “government policy”. Error #3: In addition to repeating Error #2, this passage fails to note that as many as 40% of the women were Japanese, most of whom weren’t forced into brothels at all. (Some of them might have been forced in the sense that their fathers sold them to a broker, but that wasn’t the Japanese government’s doing. The same thing happened on the Korean peninsula.) It also would have readers believe that all of the Asian women were forced, overlooking the mountain of evidence (including that held by the U.S. government) concerning those women who joined voluntarily. The ambassador’s letter followed an intense debate inside the Japanese government about how to limit domestic damage from the resolution, according to Michael Green, a professor at Georgetown University who until 2005 was senior director for Asian affairs at the National Security Council….Several Japanese and American experts on Japanese politics said that Abe’s remarks this year on the comfort women appeared to have been an attempt to curry favor with his conservative, neo-nationalist base within the ruling party, which resists and resents foreign demands that Japan show contrition for its behavior during the war. Mr. Green is almost certainly incorrect. The Japanese government probably did have an intense debate about how to respond to the resolution—they would not have taken such a drastic step otherwise–but limiting domestic damage is not one of their concerns. And anyone who thinks Mr. Abe’s remarks are “an attempt to curry favor with his conservative neo-nationalist base” is just plain wrong. The Japanese government will not suffer domestic damage from the resolution. The first Kyodo poll taken in Japan after the issue erupted showed that Mr. Abe’s approval rating during that time slipped a mere 0.4 of a percentage point. In other words, considering usual margin of error for polls and the downward trend in his polling numbers at the time, the resolution might have helped his ratings. The response of the Japanese media to the resolution has ranged from outright fury at the United States on the one extreme, to the suggestion that the government just let the storm blow over on the other. The latter position was taken by the left-leaning Asahi Shimbun, Mr. Abe’s harshest media critic. In short, the only government who will suffer an image problem in Japan over the resolution is the American government. Indeed, the Post itself reports the resolution has “angered the Japanese public”. That makes it unlikely the government will take a hit, as the Post suggests it might five paragraphs later. Does not the newspaper read what it is writing from one paragraph to the next? It looms as yet another embarrassment for Abe…Abe’s Liberal Democratic Party could lose control of the country’s upper house in an election on July 29, some public opinion polls suggest. Not wanting to embarrass Abe before that election, the House leadership has agreed to put off adoption of the comfort women resolution until after the vote, Honda said. It is not possible to take Mr. Honda’s statement seriously. We’ve seen that the Japanese public is angry over the House resolution. We’ve seen that Prime Minister Abe has not suffered in the polls because of this issue. Some House Democrats have been pushing this resolution for years, so it’s not even about Mr. Abe. How can they embarrass him? Why would they delay the passage? Consider: The resolution is the work of Democrats in the House of Representatives. Mr. Abe is a conservative, and they most definitely are not. The Japanese public doesn’t care for the House resolution. House Democrats don’t want to the pass the resolution before the upper house election because it might create negative repercussions among the Japanese public and generate a protest vote for Mr. Abe’s party. In my first post on this issue, I warned that the House resolution might have serious negative consequences. And now, the House’s pseudo-legalistic and self-congratulatory vaudeville performance, combined with factually inaccurate slapdash journalism whose intent is to sell a contrived story rather than the facts, has driven the Japanese to take a diplomatic step unlike any other it has taken with an ally in the postwar period. More than a few Japanese will consider this a betrayal. Meanwhile, the only benefits accruing to Americans are that a few congressmen will get the opportunity to indulge in vainglorious moral preening and to receive the votes and financial contributions of some constituents in a few West Coast districts. In the long run, those Congressmen will find that they did their country a disservice. THE TOKYO DISTRICT COURT sentenced fund manager Yoshiaki Murakami to two years in prison for insider trading on Thursday. Japan has long tended to frown upon get-rich-quick schemes, fostering docile conformist salarymen. Legal systems in most countries do tend to frown on get-rich-quick schemes. Japan is no exception. The sentence contains an obvious non sequitur. How does frowning on those schemes foster “docile, conformist salarymen”? Put aside the puerility of the statement for the moment. What is a rank generalization of this sort (regarding a nation of 120 million people) doing in a news story to begin with? Are we to take this to mean the salarymen in other countries are wild, untamed non-conformists living life on the edge? Why does the Associated Press accept and distribute content that a high school English teacher would reject as drivel if it were to be submitted in a composition? As Michael Crichton has said, “We need to start seeing the media as a bearded nut on the sidewalk.” There’s a reason I’ve put that on the sidebar at right. I’ll say it again: If your knowledge of Japan is derived from what you read or see in the mass media, then everything you know is wrong. ONCE UPON A TIME, in the fairy tale called The Three Princes of Serendip, their royal highnesses made fascinating and delightful discoveries by accident while traveling hither and yon. The English author Horace Walpole was so intrigued by the idea he coined the word serendipity to describe the occurrence of these discoveries. Japanese festivals originated as events for communing with the divinities, though over the centuries they also have evolved into what has become the world’s greatest free entertainment. 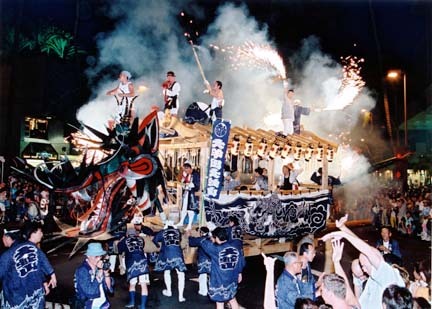 The Shichinen Matsuri, however, was created with the intention that it actually be entertainment. Years ago, the area suffered chronic epidemics that worsened as the population grew. The local people believed these epidemics were caused by the spirits of those who had died for crimes they hadn’t committed, as well as evil deities from overseas. Their solution was to present a 16th century version of Japanese vaudeville to pacify the spirits in the hope that the evil ones would find it so enjoyable they would become distracted and wander away. The festival was held at the start of the rainy season, when contagious diseases often raged out of control. 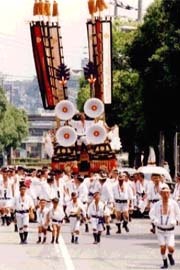 These performances include a parade of three mikoshi carried by 300 people (first photo). This is one of those mikoshi processions that features rough collisions, so the Shichinen Matsuri was known as a “fighting festival” at one time. There are also taiko performances, traditional floats, a rice planting ceremony, and a long sword demonstration (second photo). The performers with the long swords glare, strike poses, leap, spin, and slash at each other. This year’s newspaper reports say the spectators were so thrilled, they spontaneously erupted into shouts of “Japan’s greatest!” and “What a Man!” Some people here still dig the old-fashioned manly arts. 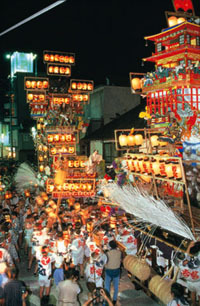 The Shichinen Matsuri is recorded in the Johamichi-no-Ki, an Azuchi Momoyama period travelogue, and is said to be at least 440 years old. It is unusual that during those 400-plus years, there has been no change in the form of the festival, which is now an intangible cultural property of the prefecture. 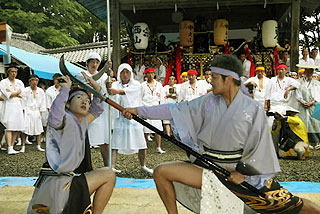 Another unusual aspect is that the performances are not limited to the shrine grounds; they are staged throughout the town, even in peoples’ yards. For a look at some more photos, try this site. Then came the moment of serendipity. At the bottom of one article I spotted a brief mention that nine municipal employees and city councilmen from Boryeong, South Korea, visited this year’s festival to observe. Takahama and Boryeong have been conducting cultural exchange programs since 2005. The article also noted that some representatives from Takahama would visit Boryeong’s annual festival. The rendition of the name of the Korean event in katakana, one of the two Japanese phonetic alphabets, looked like “Mad Festival”. Who could resist that? But when I started sleuthing, I discovered that it wasn’t the “Mad Festival”—it was the Boryeong Mud Festival! Hone’ya babe! The Koreans are mudders too! Mud is the key element in several Shinto festivals in Japan, and the city of Kashima, Saga Prefecture, holds the Gatalympics on the muddy tidelands of the Ariake Sea every May. The Boryeong Mud Festival is not just any old fete, either. It was selected the best festival by the South Korean Minister of Culture and Tourism! Boryeong is the site of Daecheon beach, which by all accounts is a great place to either go swimming or to get down and get muddy. The mud at the beach is said to have “higher germanium, mineral and bentonite content compared to imported products” and is very good for the body. In fact, it is so good that the locals decided to commercialize their mud and sell it overseas for beauty treatments. It received ISO 9002 Certification in 2001 and passed the safety tests of the US Food and Drug Administration in 2004. I’ll bet the Japanese can’t say that about their mud! The folks at Boryeong came up with the brilliant idea to promote their area by combining their prime attractions–mud and the beach–and launched the mud festival in 1998. And it’s happening right now, all week long! If you haven’t already made reservations, however, you may be out of luck. This is a popular event, especially among the in-country foreigners, and hotel rooms are hard to come by. This is a high profile event. There is a gorgeous beach there as well, which will come in handy as you won’t have any chance but to get dirty. You will be put into a prison until you get some mud on your body. You will have a chance to join the adventurous silt extreme training experience. Now how can anyone pass that up? The prime minister’s name was written on the lantern without his title, indicating that he made the donation as a private citizen. The media are intensely interested about prime ministerial visits to the shrine for several reasons. Obviously, one reason is that former Prime Minister Koizumi’s annual visits during his term in office ignited public hysteria in China and South Korea, with the governments of both those countries fanning the flames. It’s not good for cordial diplomatic relations for folks to protest by cutting off their fingers and shooting flaming arrows into the grounds of the Japanese embassy. Another is that the visits are important domestically because they symbolize what some see as the creation of an identity for a post-war Japanese state. Yes, the Japanese are still working this out, which is why Constitution reform continues to be an issue. On the other hand, some in the media, particularly overseas, prefer to portray this as a “resurgence of Japanese nationalism”. It makes for jucier copy. Conservatives (for want of a better word) say that since its defeat, Japan has had plenty of government, but hasn’t been a state (in the nation-state sense of the term). They think Yasukuni is an essential part of that identity as a memorial for the country’s war dead in the same way Arlington serves in a similar role in the United States. An official visit by a Japanese politician is not really a hot-button political issue in itself—voters of an ideological bent already have made up their minds one way or another based on their broader philosophy. During the last Diet election, it was ranked a low fifth in opinion polls on the list of issues voters considered important. Some in business and financial circles, however, would rather the politicians stay home. It’s bad for business in East Asia when people in the easily irritated countries stage boycotts or break the windows of the local Japanese branch outlet. The prime minister himself is rather coy about both his past actions and his intentions for the future. Mr. Abe was a strong supporter of former Prime Minister Koizumi’s inflammatory visits, but he refuses to tell the media whether he went last year or not, and they weren’t able to catch him in flagrante. He passed up the opportunity to go in January during the New Year’s holidays, when it is customary for Japanese to pray at shrines, and followed the example of Mr. Koizumi’s predecessor, Yoshiro Mori, by going to the Meiji Shrine instead. Mr. Abe also donated 50,000 yen out of his own pocket for a masakaki to decorate the Shinto altar at Yasukuni’s spring festival this year. And of course many are waiting to see what he will do on August 15th, the date of the Japanese surrender. A curious phenomenon regarding the Mitama Festival, however, is the relative absence of media coverage of the many prominent politicians besides Mr. Abe who also donated funds to buy a lantern. 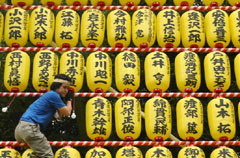 For example, the photograph shown here appeared in a Japanese newspaper with the caption, “Lanterns donated by Prime Minister Abe and many other politicians hung at the shrine”. A careful examination of the photograph shows that the lantern with Mr. Abe’s name on it is not pictured. But there at the top left is the lantern donated by Ichiro Ozawa, the head of the Democratic Party of Japan, the country’s primary opposition party. His lantern even reportedly contains the inscription, “Member of the House of Representatives”, though it is not clearly visible in the photo. Considerable media coverage is devoted to Mr. Abe’s shrine-related activities, but Mr. Ozawa’s donation, if it is mentioned at all, is noted only briefly at the end of reports. If it is important that the public be made aware of the prime minister’s actions, is it not also important that the public be told in equally unmistakable terms about the behavior of the man who would replace him if his party took power? Perhaps Japanese readers will disagree, but it might be that Mr. Ozawa’s donation is lightly covered so as to slip the news by some of his party’s supporters. Political activists of both parties know who’s doing what, of course, but some voters who generally support Mr. Ozawa’s DPJ may not be paying close attention. The DPJ has to be the gooney bird of political parties in the advanced industrialized countries. It was formed during the political reorganization of the 90s, and primarily consists of people who bolted Mr. Abe’s party, the LDP, and those who left the Socialist Party (now the Social Democrats) when it imploded. In other words, it’s a walking contradiction—it is comprised both of Diet members who signed the recent Washington Post advertisement rebutting the comfort woman resolution, and a few serious socialists who are knee-jerk anti-Emperor/Flag/National Anthem/American Alliance, and who supported their old comrades’ so-called Peace Cruises to Pyeongyang in years past. This grouping of unlikely bedfellows is one reason the party has yet to gain traction as a serious opposition group in Japan. They remain a catchbasin for the votes of those who are opposed to the LDP for various reasons, but are too middle-of-the-road to cast a ballot for the Socialists or Communists. The leftist element of the party might not care for their standard bearer publicly supporting a Yasukuni festival as a member of the Diet. In the past, Mr. Ozawa has called for the convicted war criminals to be enshrined at a separate location to allow politicians to visit Yasukuni itself. Their enshrinement didn’t stop him from buying a lantern, however. The Mitama Festival, incidentally, just ended on the 16th. It was inaugurated in 1947 for the consolation of the souls of the nation’s war dead. More than 30,000 lanterns are lit at night, and this photo from the Japanese portion of the Yasukuni website gives you an idea what it looks like. The shrine also planned to have the students at a local women’s junior college and children carry mikoshi, or portable shrines, but poor weather forced the cancellation of that event. Anyone naive enough to think that a Japanese apology to East Asians for the comfort woman system in World War II would bring “closure” should read this article in Time magazine. The children of Holocaust survivors–not the survivors themselves, but their children–have filed a class action suit against the German government asking for remuneration for their psychiatric care. They too, they claim, suffered as a result of German actions during the war. The number of people that are party to the suit is said to be in the thousands. The paper lanterns are lit every night during the 15-day period from July 1 to July 16 at different shrines and temples throughout the city, with the biggest single event being the one held at Terukuni on the nights of the 15th and the 16th. 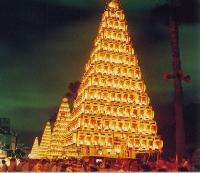 That event features large, 2.5 meter-wide lanterns and about 1,000 smaller individual lanterns lining the main path to the shrine. The event is largely conducted by neighborhood associations and children’s groups, and most of the lanterns are handmade. The city sponsors a big fireworks display, performers dance on stage, and about 200 stalls are set up to sell fried octopus and other Japanese summertime festival treats. Between 200,000 and 300,000 people turn out every year, but officials estimated that only about 150,000 would make it this year, perhaps because of the typhoon that passed through the area this weekend. Now that’s what I call a City of Light! I cannot urge you strongly enough to visit this site. The photos are stunning and will give you an idea of the scale of the event, particularly #20. If you don’t read Japanese, just click on the column of red numbers at the right.